Orbital Sciences Corp. says the first full-up test flight of its Cygnus cargo resupply ship to the International Space Station will probably slip to September due to a combination of factors, including an engine replacement on the mission's Antares rocket and a scheduling conflict with a Japanese logistics spacecraft. Photo of the Cygnus spacecraft at the launch site at Wallops Island, Va. Credit: Orbital Sciences Corp. The first flight of Orbital's Cygnus resupply freighter, an automated cargo carrier developed in partnership with NASA, was expected this summer. 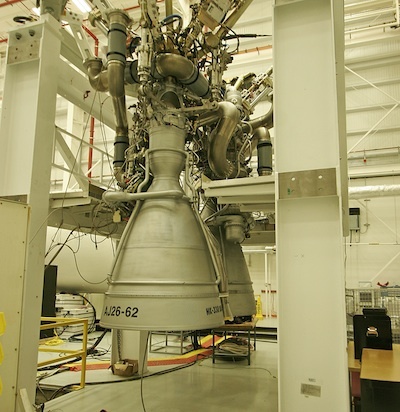 But Orbital officials decided to swap out one of the AJ26 first stage engines on the spacecraft's Antares rocket, adding three or four weeks of prep time before the mission is ready to blast off. The engine work involves replacing one of the Antares rocket's two AJ26 first stage engines with another unit to check whether a seal is working properly, according to an update posted on Orbital's website. Barry Beneski, an Orbital spokesperson, said the flight could theoretically be ready for launch in August. But a Japanese H-2 Transfer Vehicle is already scheduled to fly to the space station in August, taking precedence in the international lab's busy manifest of visiting crew and cargo spacecraft. "Our expectation is we would be ready to go in August," Beneski said. "If [the HTV] schedule holds, we will probably go on the other side of HTV. However, we're going to be ready in case there is an opening." The first Cygnus mission is a demonstration flight under NASA's Commercial Orbital Transportation Services program. The COTS program is a public-private partnership in which NASA is paying Orbital up to $288 million for development of the privately-owned Cygnus spacecraft, which will supply food, experiments and spare parts to the space station. Once Orbital completes the demo mission, the company will conduct eight operational resupply flights under a $1.9 billion contract with NASA. The space agency arranged a similar deal with SpaceX, which has launched three of its Dragon spacecraft to the space station. The first of Orbital's eight contracted cargo deliveries could occur as soon as November, company officials said. Orbital's Antares rocket launched for the first time April 21 and successfully deployed a dummy payload in orbit. "We always knew late June to early July were going to be difficult launch dates for Orbital to make, but we agreed to hold this date and see how the test flight went and Antares processing was coming along," said Michael Suffredini, NASA's space station program manager. "We also wanted to see if the HTV launch date would hold." The Cygnus spacecraft, already filled with propellant and cargo, is ready for attachment to the Antares rocket inside Orbital's horizontal integration facility at NASA's Wallops Flight Facility in Virginia. Engineers will move the craft to the Antares rocket hangar once the booster is ready. The inaugural Antares launch April 21 went exactly as planned, according to Orbital Sciences. "While the launch looked great to the casual observer, our team was hungry for data in order to validate our expectations for the rocket's performance," said Mike Pinkston, Orbital's Antares program manager, in a statement posted on the company's website. "Comprehensive post-flight analysis is an absolutely critical step to understanding exactly how a launch vehicle has performed and whether there are any necessary adjustments to its main systems prior to the next launch. Having intensively reviewed the data for a couple weeks, our conclusion was the inaugural Antares flight really was as good as it looked." 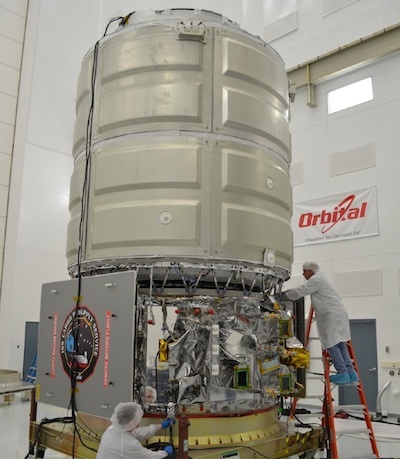 An engineering evaluation of data recorded by more than 70 sensors on the rocket's Cygnus mass simulator payload confirmed Orbital's expectations that the Antares will provide a "benign launch environment" for future Cygnus spacecraft and satellite passengers, Orbital said.